Pleiades Gallery promotes the beauty and mystery of visual art. Pleiades is a fine art gallery owned and operated by local artists who celebrate Durham’s rich, diverse cultural energy. Pleiades welcomes new art appreciators as well as established collectors and strives to build strong relationships with our customers. 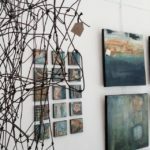 We are a gallery that celebrates Durham artists and connects the various arts communities where we live.